INDIANAPOLIS, IN--(Marketwire - October 1, 2010) - Kids are welcome to bring along their popular Nickelodeon friends while staying at the Indianapolis Marriott North hotel where the "Nickelodeon Your Stay" package allows children to enjoy their favorite friends while traveling with family for weekend getaways in Indianapolis. Whether traveling into the city for race day fun or a trip to the popular Conner Prairie, the excitement of Indianapolis and family travel will be more fun for everyone with this Northside Indianapolis hotel's "Nickelodeon Your Stay" package which entertains kids with their favorite Nickelodeon characters. Children whose parents book their stay into the Indianapolis Marriott North hotel with the "Nickelodeon Your Stay" package will receive a Nickelodeon activity book and a silicone bracelet with access to a secret game website. Guests will also receive an awesome gift bag commemorating the stay that includes sunglasses, a Build Your Own SpongeBob SquarePants craft activity and a splash ball. Evening turndown service is included along with a souvenir pillowcase and bedtime book for children. This special package is available for booking weekends through Dec. 26, 2010* or weekday travelers may purchase the package, if available. When booking accommodations online at http://www.marriott.com/hotels/travel/indno-indianapolis-marriott-north/ travelers should use promotional code NK6 or call 1-877-NICK-STAY to reserve the "Nickelodeon Your Stay" package. Awarded excellence honors for its food and beverage, customer and staff service by Marriott Hotels & Resorts International, the Indianapolis Marriott North provides guests with luxury accommodations and a beautiful lake view in the heart of Keystone at the Crossing. The hotel is home to the award-winning Bistro 33, which serves up contemporary American cuisine in a relaxed, upscale atmosphere that is unrivaled among North Indianapolis restaurants. Offering unique menus for breakfast, lunch and dinner, the Bistro 33 and other nearby eateries provide guests with a wide selection of menu options from mouth-watering steaks to delicate desserts. In addition to fine restaurants, Indianapolis North guests will find the hotel's location perfect for easy access to popular attractions including the Indianapolis Motor Speedway, Lucas Oil Stadium, Monon Trail, Conner Prairie and the popular Children's Museum. *Accommodations must be booked by Dec. 5, 2010 and weekend stays must include a Friday or Saturday night. Guest will receive one activity pack per child and one night's turndown service per child, per room, per stay, up to a maximum of two children per room, regardless of total length of stay. Please see hotel website for additional terms and conditions. 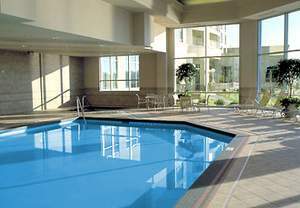 The Indianapolis Marriott North Hotel is a premier Indianapolis hotel property providing a serene setting amidst the excitement of city shopping and the many local attractions that make Indianapolis a great getaway destination. Spacious guest rooms and hotel suites include big screen HDTVs with Jack Pack connectivity, high-speed wired and wireless Internet access and luxury bedding ensembles. A concierge level is available for added amenities and guests will enjoy complimentary on-site parking. Nestled in the prestigious Keystone at the Crossing, within walking distance to shopping, dining and entertainment. Take a leisurely stroll around the lake just outside our back doors.